I Rock London: Viral Sensations Play a Safe Set (But Sell Innovative Merchadise Afterward). Viral Sensations Play a Safe Set (But Sell Innovative Merchadise Afterward). 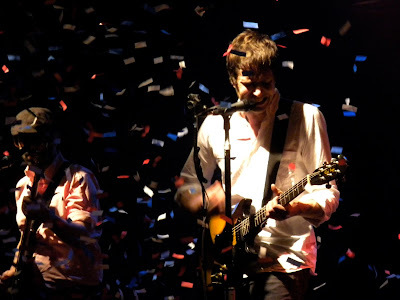 With a torrent of red white and blue confetti filling the air, OK Go burst into their recent set at Camden Town’s Electric Ballroom with their recent smash hit, “Invincible.” The audience sang along with singer Damian Kulash Jr’s scruffy-yet-polished pop vocals. “So how are ya, London?” Kulash asked the crowd afterward, before launching into “A Million Ways," another track from their sophomore album. A particularly dedicated group of fans re-enacted the choreography from the song's video, which became a YouTube phenomenon. The Chicago quartet played a relatively safe performance for such an innovative band - after the show, at the merch table, they sold recordings of the entire performance, with video and music, on USB drives. For their encore, however, the band upped the spectacle by sporting digital marquee jackets and fuzzy, laser-strapped guitars. They fogged up the place and burst into a more raw and playful performance. - Text by Alex Brickman. Image by Rick Kauffman.